There are some people—wrong as they may be—who think the beautiful carnation is not a first choice, first class flower. While it’s true that carnations are one of the most budget-friendly choices, it’s also true that they are truly one of the most lovely and versatile event flowers you can select. The low price is just a bonus! Carnations have an amazing texture, like elegant ruffles, and many varieties come with a soft, spicy fragrance. They come in a truly amazing multitude of colors (even green) and shades which makes working with them an additional pleasure. 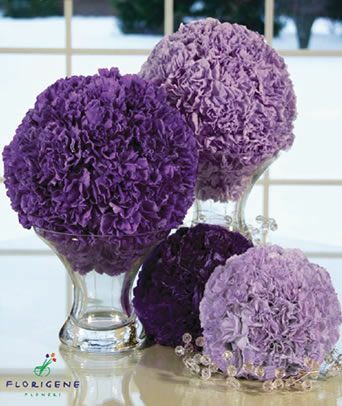 Use all one color of carnations and let their texture do the talking. One color will create a big pop of visual impact for your tables or venue. Coordinate with your theme colors or choose a complimentary shade to accent them. 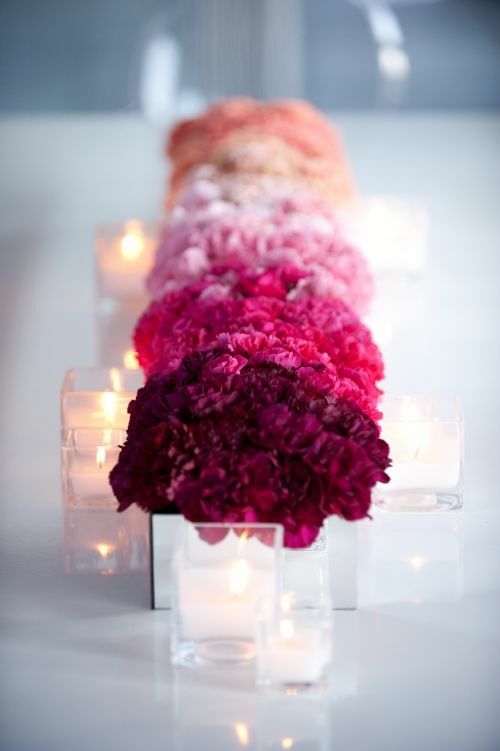 Or, create an ombre effect by setting up a mass of carnations that run from dark to light shades of a single color. 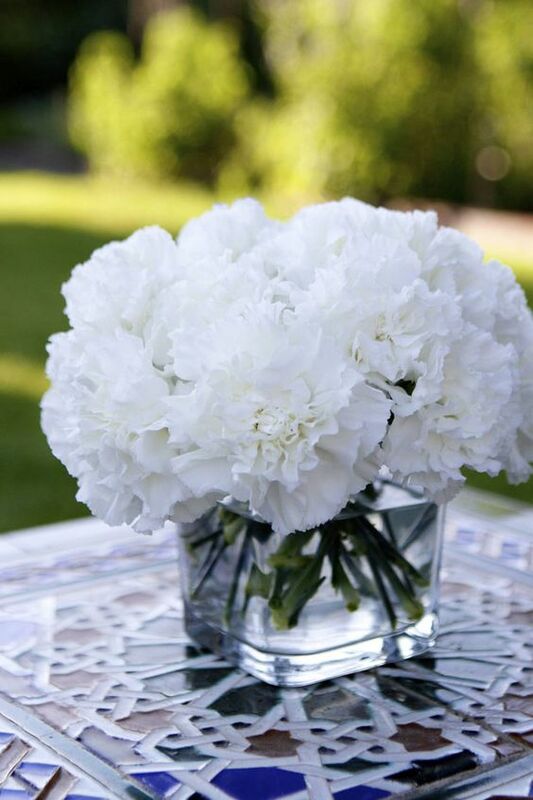 Even a simple grouping of white carnations looks amazing in a modern glass cube vase. 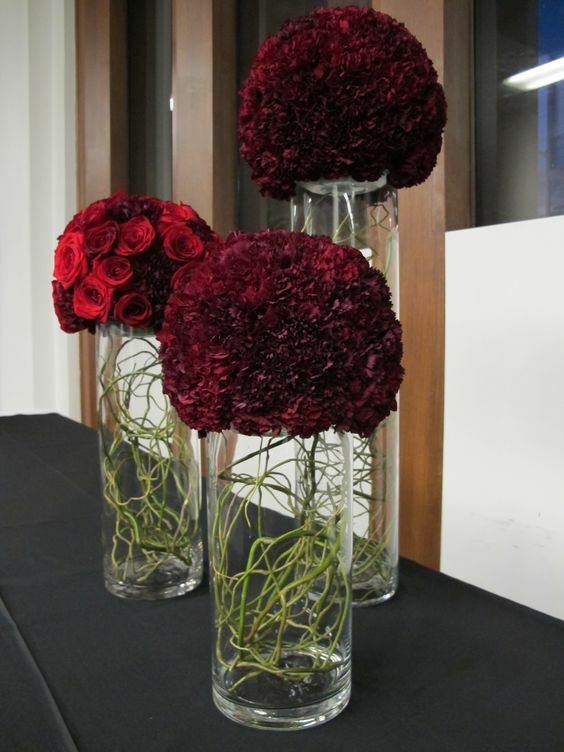 Choose interesting and varied vases and heights for your carnations and let them shine with added impact. Carnations may look delicate, but are one of the heartiest flowers you can choose. 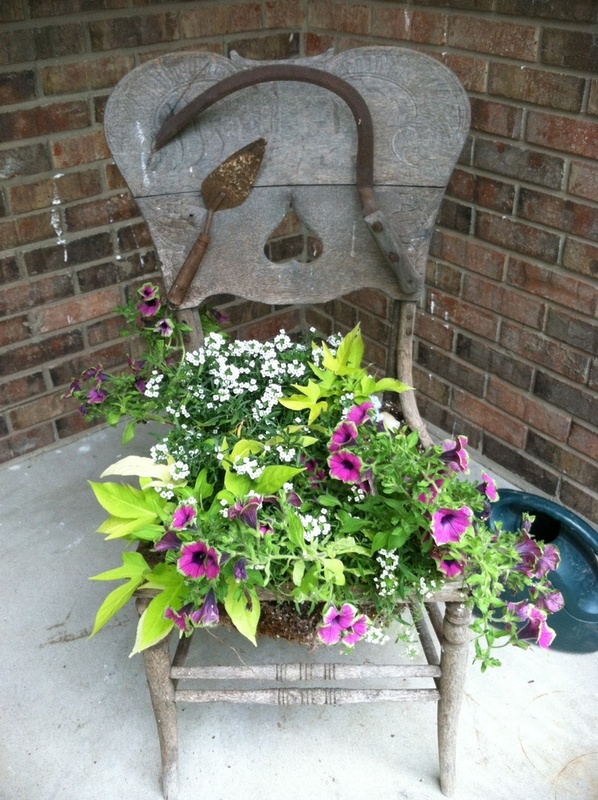 They don’t wilt easily in a hot venue and aren’t too fussy about humidity or lots of water. Pomanders can be made with multi-colored carnations and set in different shaped vases, set on tables, hung from trees, suspended from shepherd’s hooks…the possibilities are endless. Set them down the middle of the table to use as your centerpiece! 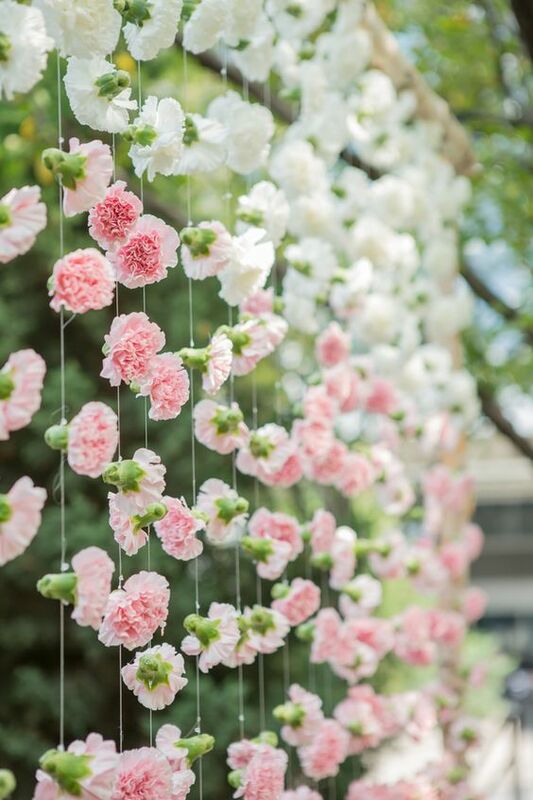 Because carnations are sturdy, with thicker stalks, they are also a perfect choice for creating hanging “flower curtains” or other floral backdrops. This is a great project for the DIY planner who has lots of helpful friends! Fishing wire, needles and bulk carnations are all you really need. Click to read more about Floral Backdrops. Carnations are very hearty and long lasting, making them an elegant choice for your bridal bouquets! They will stand up well to heat and sunshine making them an especially good pick for outdoor, beach or summer events. Carnations keep their structure well as they are compact and hearty. They are the perfect choice for creating modern designs that can really add life and interest to your event tables. 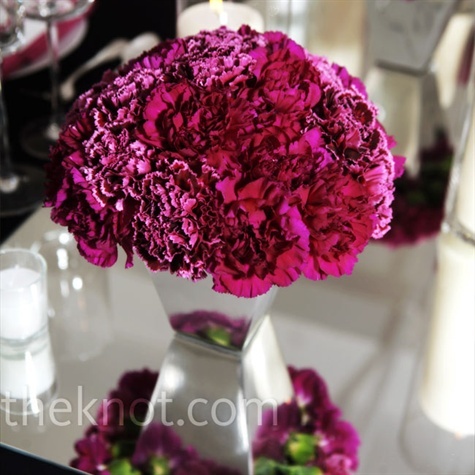 Whatever style, color scheme or venue you choose, don’t overlook the sensation of a carnation! Click to see how to buy bulk carnations. Keep It Simple. Buying bulk flowers online can save you big bucks, so consider online vendors such as BunchesDirect who can also ensure freshness and quality. Stretch your decorating dollars even more by using only a few blooms per vase or container, and create decorative touches that are beautiful as well as economical. For example, a single rose placed on top of a candlestick holder is an unexpected way to create visual impact for less. Rummage in your grandmother’s cupboards, ask to borrow from friends and family, scour garage and vintage sales, and visit second hand stores for different candlestick holders, or use antique teacups for another creative display option for roses. Bigger is Better. Choose blooms that are larger, such as bright and cheery gerbera daisies, and only a few will go a long way. These yellow chrysanthemums are very inexpensive, and look wonderful in a series of small and simple vases. Water Things Down. Water is your budget-saving friend. Submerging or floating a few blooms in water lets you use fewer blooms without sacrificing any style points. Water and flowers are a wonderful combination of elements from nature that will dress your tables beautifully, at low cost. Shown here, pink and cream roses with some bear grass create beautiful low-budget centerpieces. Submerging the blooms entirely is another way to create big style. The water magnifies the shape and color of the flower and stem, essentially increasing their visual impact and interest. Add some floating candles for some additional gleam. Lighting up your submerged flower arrangements provides even more drama.Making your own submerged flower arrangements is quite easy! Click to watch how to make your own. The elegant, trumpet-like shape and vivid color of these orange calla lilies is a perfect choice for this submerged arrangement. Choosing seasonal flowers is another way to save money as the prices may be lower. Ask your floral consultant for advice. Consider Baby’s Breath. 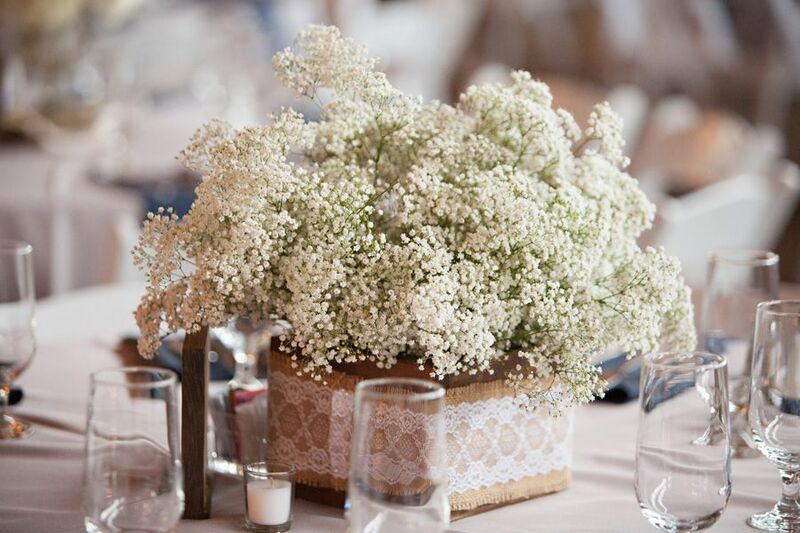 Baby’s breath, or gypsophilia, is a perfect choice for budget-conscious brides, as well as any bride who values decor that is feminine and romantic. This delicate, airy beauty can be used in so many ways, from aisle decor, centerpieces, event decor, floral crowns, to entire bridal bouquets. A few bunches go a long way due to their size and color, and it is very inexpensive. It’s always a gorgeous choice! Check our Pinterest Page to see more amazing ways to use Baby’s Breath at your wedding or event. Consider it for your bridal bouquets for a coordinating look at low prices. You can also save money on your wedding flowers by moving them from ceremony to reception. Check out our blog on How To Re-Use your Wedding Flowers for even more budget saving tips! The busy holiday season is right around the corner! Thanksgiving is almost here (in the United States), with Christmas and Hanukkah following shortly after. These holidays provide cherished time to reconnect with family and friends. If you are hosting an event or planning a wedding this season, don’t miss these wonderful ideas on how to dress up your tables. These DIY centerpieces are easy to make and big on “WOW” factor, which is always a perfect combination in our eyes! However you decide to decorate your holiday table, BunchesDirect wishes you the best of health and happiness to those around it, from our home to yours. These centerpieces (above) would look amazing at a fall event or a Christmas wedding. Anything clear and pretty will work as your container, such as these brandy snifters. Purchase some beautiful hydrangea and greens from a reputable online flower vendor, to get the best bulk pricing (BunchesDirect has awesome prices and will deliver right to your door!) . Fill glasses with cranberries and water. Add the hydrangea and other assorted greens of your choosing and presto, instant centerpieces! Use a gourd or a pumpkin as your “vase” for truly unique, seasonal and eye-catching autumn or Thanksgiving centerpieces. Purchase burgundy chrysanthemums, orange roses, and seeded eucalyptus from a reputable online flower vendor. Clean out the pumpkin, line with plastic. Add a block of oasis foam (trim to fit) and fill with water. Arrange and insert the flowers into the foam for stability and then enjoy all the rave reviews your guests will give you. These eye-catching Thanksgiving or autumn centerpieces use a variety of clear vases (raid the cupboard or visit the local Dollar store). Purchase bronze spider chyrsanthemums (BunchesDirect has amazing prices). Fill the vases with seasonal chestnuts and water, and top with the mums to enjoy these cute table toppers. These adorable centerpieces are perfect for any Christmas wedding or event! Roses or red carnations are always a beautiful choice for holiday decorating and are available at great prices. 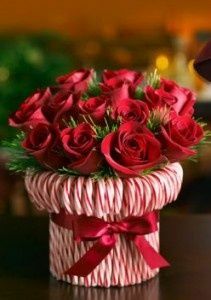 Red roses, candy canes, and some red ribbon are the perfect way to dress up (and hide) any container you choose. You can also use red and white candies to fill a clear vase (see below.) Beautiful fresh red roses are available by the stem or by the box, from BunchesDirect. For Hanukkah Centerpieces, choose blue and white vases, or clear vases filled with blue and white ornaments, candies, or decorative foil paper. Add decorative elements such as stars or dreidels. 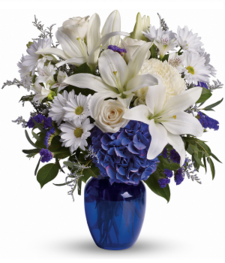 Purchase blue and white flowers such as white asiatic lilies, blue hydrangeas, white hydrangeas, blue iris. white roses, white carnations, white football mums, or white gerbera daisies. These will all look beautiful in the container of your choice. You can also select ready-made centerpieces and save yourself some added work! Happy Holidays from your team at BunchesDirect! It may still be summer, but fall is right around the corner! If you are still looking for inspiration for a fall wedding or special event, we’ve gathered a few of this year’s top trends and color schemes to help guide you. Structure: Summer bouquets and flower arrangements are often less formal, to recreate an airy “fresh from the garden” look. Fall bouquets and centerpieces, however, can be more structured, and can be boosted by the addition of extra touches such as viburnum or hypernicum berries, apples, gourds, tree branches, autumn leaves, or other rustic fall elements. Color Schemes: Summer flower hues tend to be softer, in pinks, corals, roses, lavenders. For fall, think warm, earthy tones. Red, orange, coral, yellow, cream, burgundy: any of these would work well for your floral color palette during the autumn months. Containers: The containers you choose for your centerpieces or other arrangements can also be more rustic and earthy. Try scouring flea markets for some antique urns, or rustic pots in materials such as terracotta or faux metal such as bronze or copper. These warmer hues will give your decorations a much more autumnal feel than would an airy crystal vase or pastel container. You can also get creative and make your own rustic containers; go for a walk in the woods, gather some twigs, and get out your glue gun to add the sticks to a plain container. Flower Choices: When it comes to flower choices, sturdier flowers in deeper, richer hues will be most suitable for a fall event. Dahlias are a great choice, since they come in burgundy, orange and dark purple, all of which are perfectly suited to this time of year. Roses are always a great wedding staple, and are also available in these gorgeous rich tones. 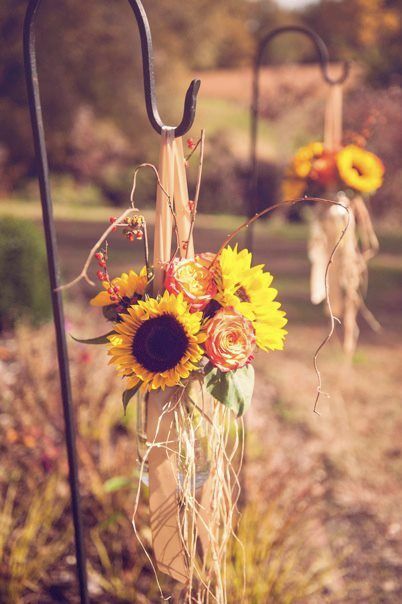 Sunflowers will always add a warm sunny charm to a fall event in the country. For added drama, consider deep purple calla lilies, or bronze fuji spider chrysanthemums, which are only available in the fall. Orange asiatic lilies, orange gerberas, red, burgundy or orange chrysanthemums would also make excellent choices for fall bouquets and centerpieces. Aisle Décor: Scatter orange, yellow and red rose petals down the aisle for a dramatic fall look. Add tall curly willow branches, chrysanthemums in warm colors, or bright pops of sunflowers hanging from rustic shepherd’s hooks to complete the look. Pumpkins carved with monograms of the wedding couple would also be a lovely personal touch. Bridal Bouquets: If you are looking for gorgeous pre-made bridal bouquets, there are some amazing options in these rich, warm fall hues that will coordinate perfectly with your autumn wedding theme. Sunflower bouquets can be lovely as well. Try Calla Lily Delight, Warm Springs, or Hint of Fall. Be sure to check out the BunchesDirect website for many more options! When it comes to wedding and event flowers, the graceful calla lily is one of the most iconic choices. Lilies are a truly lovely addition to any floral arrangement. Native to South Africa, lilies are prized for their unique flower form. Their graceful, flaring trumpet shaped blooms provide an elegant touch to any bouquet or centerpiece. Their striking green leaves are a handsome element in their own right. Calla lilies (sometimes called trumpet or arum lilies) are also versatile; they are a perfect complement to either modern, clean wedding themes or romantic and traditional décor.They come in different sizes, from larger blooms to miniature. Many people think of white when they think of calla lilies, but they are available in many colours ranging from red to pink, yellow to orange, or even a dramatic dark purple. Their form has enough impact to stand alone, which means they can be a budgeting bride’s best friend, or they can be mixed with other blooms for even more impact. 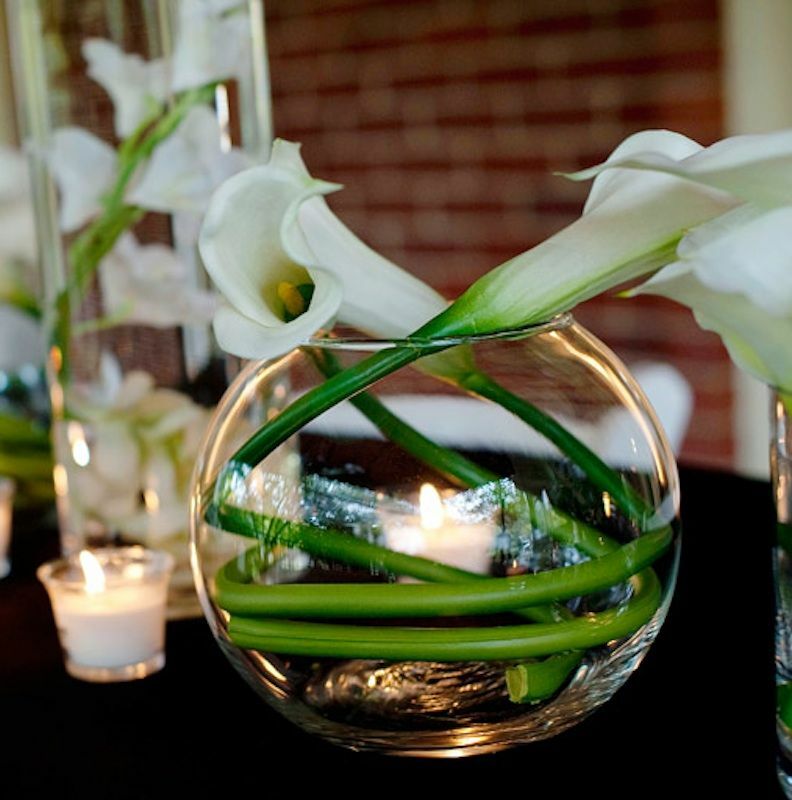 Calla lilies are an excellent choice for the DIY bride or event planner. Twine lilies of any color artfully in a glass vase and you have an instant centerpiece that is surprisingly dramatic and effective. Their bright green stems only add to the visual impact. 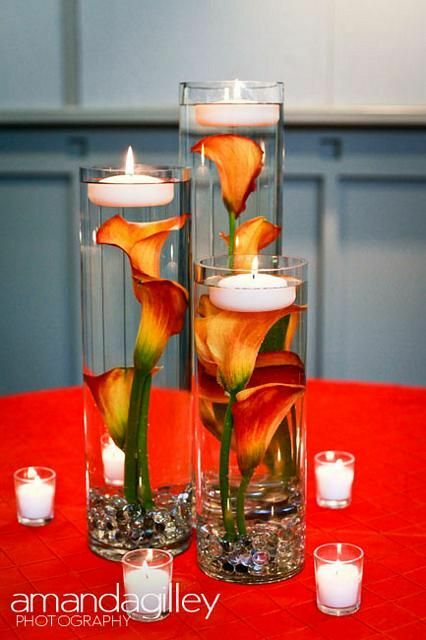 If you like submerged blooms in a centerpiece, calla lilies are an excellent choice for this too. Find out how to make your own submerged centerpiece and see how easy it can be to create a stunning centerpiece with in one of our BunchesDirect videos. Even simple wine bottles get an instant style boost from the addition of dramatic calla lilies in standout colors such as orange. Super easy, budget-friendly, and so fun! Bulk calla lilies available by stem or by box at BunchesDirect, for amazing prices. Choose your color, and get creative! These very simple vases could be purchased at your local dollar or craft store, but the addition of tall calla lilies and their repetition all down the long table adds a lot of drama. An easy and low budget table solution! Callas also combine beautifully with other flowers in vibrant colors. 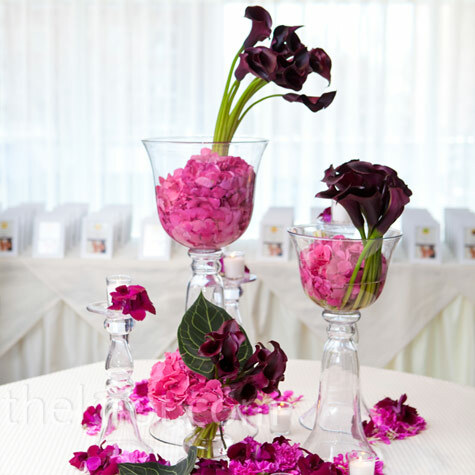 Here, dark purple callas give height while pink hydrangeas provide the “base” of the arrangement in these creative vases. You can also buy bulk hydrangeas from BunchesDirect. You can combine greens such as eucalyptus with calla lilies, and use floral foam and a wooden box to create these very rustic DIY centerpieces—click to find out how. Perfect for a garden wedding. If you are less “do it yourself” inclined, BunchesDirect offers beautiful calla lily centerpieces that are all ready to go. Simply trim the stems to your desired height and add to your container of choice. Shown here: Pink Passion Centerpiece. Don’t overlook the power of the dramatic and elegant calla lily when you are deciding on your wedding centerpieces and wedding flowers. 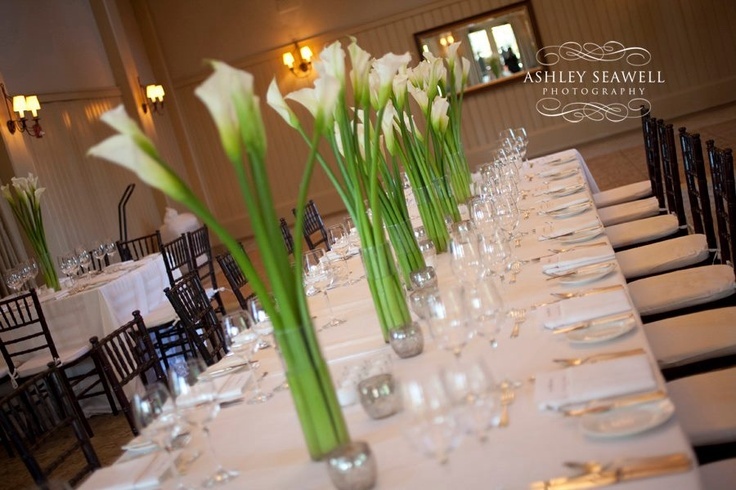 And to coordinate with your lovely lily centerpiece, bridal bouquets made of calla lilies are also a gorgeous choice! White is the classic selection, but BunchesDirect also offers exotic bouquets in vivid colors. If you are a savvy DIY bride, you know that you can order up some of the freshest and most beautiful bulk flowers from Bunches Direct. But have you explored ideas for what to put your flowers in? Don’t be limited by the traditional clear glass vase. If you get creative with the container for your wedding or event flowers, you can add a lot of “wow” factor and the kind of impact that will really get your guests talking (in a good way). Your choice of container can create a unique or personal touch for your event tables, set a mood, or help embellish your theme if you have one. We’ve gathered some pics of very creative containers to inspire you, and included some of our flower suggestions to go with them. Enjoy! Birdcages are a sweet and creative way to display your flowers! Choose a pre-made centerpiece from Bunches Direct, such as the Big Day or Subtle Beauty Centerpiece, or buy your flowers in bulk for a great DIY project. Roses, spray roses, hydrangea and lisianthus would be great choices! Set up vintage chairs around your outdoor venue and add bulk flowers or a ready-to-go centerpiece bouquet for an amazing touch that is sure to get noticed. Use vintage French-themed tins or wooden crates to provide that old world feel to your wedding. Try Oh Lola or Bygone Glamour Centerpieces from Bunches Direct to complement this look. Or, buy bulk peonies (seasonal) as shown in the photos. 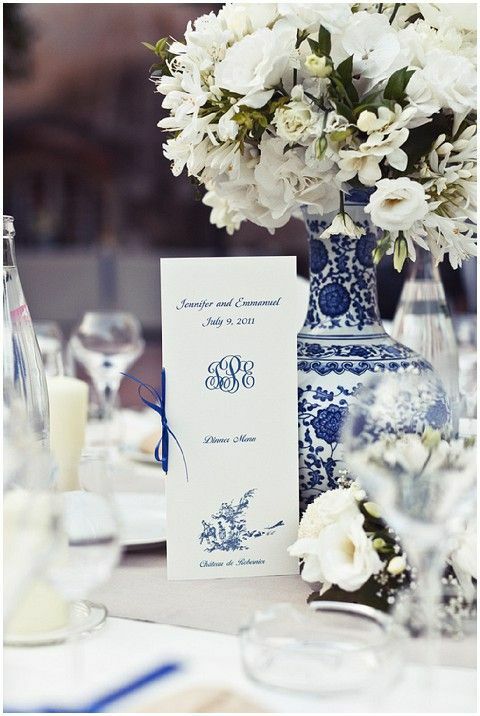 Blue and white china in a classic pattern lends instant traditional elegance to your tables. 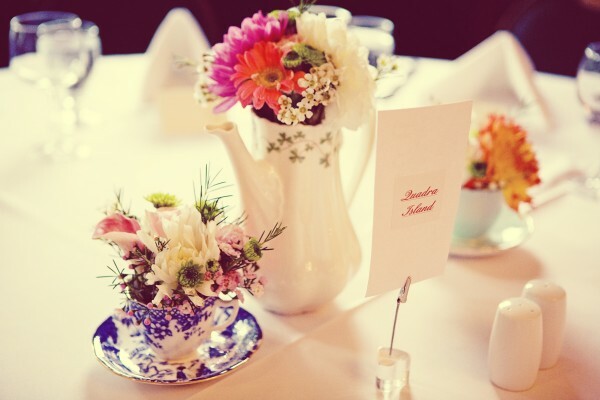 Use teacups or teapots for creative way to display flowers at a wedding– also perfect for a bridal shower. Try Sweet Heaven, Champagne Romance, or Wild at Heart Centerpieces to complete this look. Wrap inexpensive dollar store vases in birch bark or burlap, or glue on birch sticks, to create a beautiful rustic look for your centerpieces. A creative take on guest favors might be to collect a variety of small vases or bottles to display your bulk flowers. Use them to decorate the table, and tag them so that guests can take them home. Or, tag them and use as place cards. 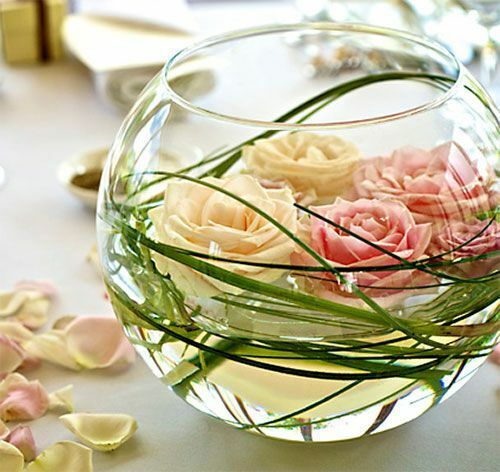 Find clear vases or wine glasses that will also hold a floating candle to create very inexpensive and elegant centerpieces that will suit a variety of themes. Buy bulk flowers such as gerberas, lilies, orchids, roses, or carnations to float in the vases. 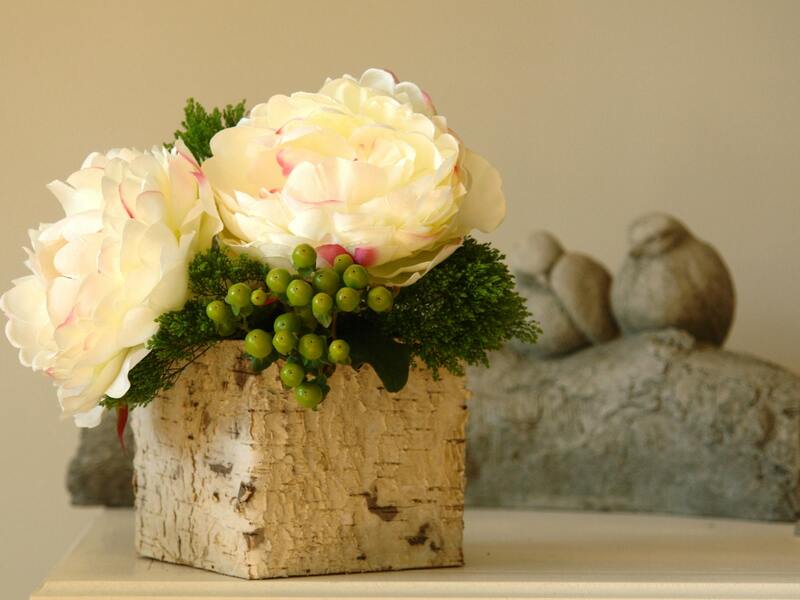 For more info on how to create submerged floral arrangements, check out our how-to video! 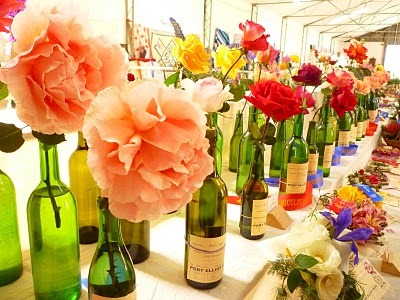 Recycle old wine bottles or other bottles for a great way to display your flowers! You can also wrap or spray paint the bottles if you want an elegant look–makes great DIY project. 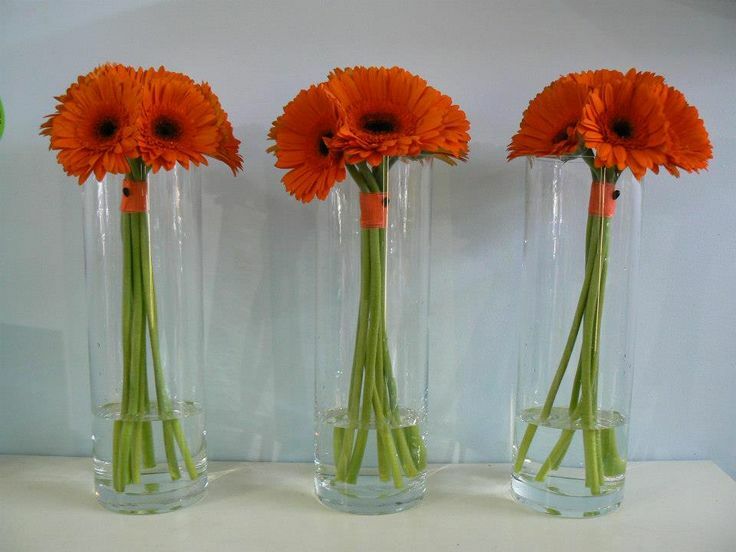 Try the Alluring Gerbera Centerpiece for a great earthy look to complement your wine bottles. Get inspired and give your wedding flower containers a little extra attention, and you are sure to create some memorable displays!